This section provides a tutorial example on how to use Chrome 24 to manage certificates installed in certificate stores. Now I want to know how Chrome 24 manages certificates that are already installed on the local Windows system. 1. Run Chrome 24 and click the menu icon. Then select "Settings" from the pop up menu. 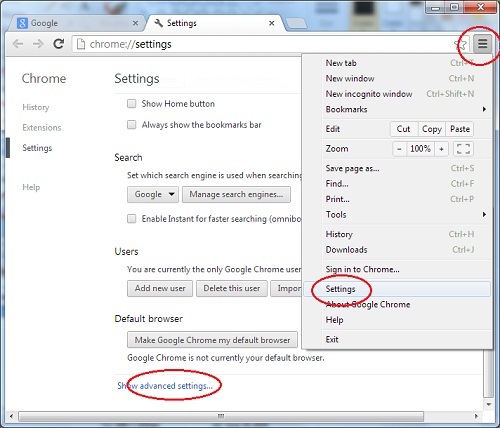 The Chrome settings page shows up. 2. Click the "Show advanced settings..." link. The scroll down to the HTTPS/SSL section. 3. 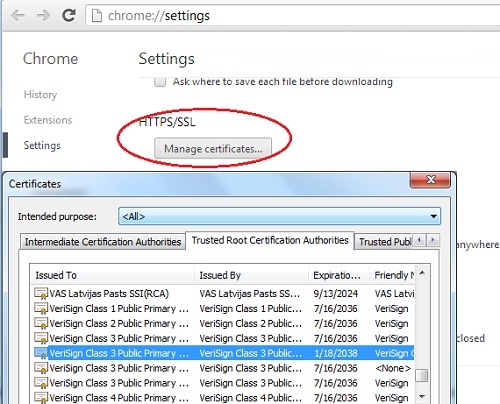 Click the "Manage certificates..." button in the HTTPS/SSL section. The Certificates dialog box shows up. As you can see, the "Certificates" dialog box in Chrome is the same as IE. This tells me that Chrome share same certificate stores with IE and uses the same tools to export and import certificates to and from certificate files. See IE tutorials for more information.